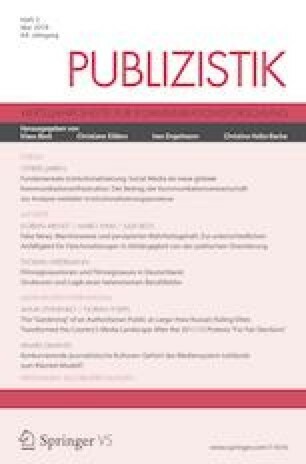 This paper aims to explore the field of movie directors in Germany and reveals that German film is far away from being an art for art’s sake. It rather expresses power relations in society and has a political dimension, which limits any autonomous practice in this field of cultural production. The paper is based on the assumption, first, that the film medium offers meaningful reality constructions. However, second, particularly in Germany, this medium is not only the outcome of a complex and diversified production process, but also sponsored—and obviously influenced—by public institutions. Accordingly, one can argue that the filmic reality constructions are the result of a struggle for legitimate meaning. Thus, throwing a light on the structures and logic of the field of German movie directors (at the top of a film project in terms of authorship and creative tasks) wants to connect the research of film to areas such as communicator research and media policy, referring in particular to the question which impact German film policy has on the directors’ role perceptions as well as the conditions and forms of their work. To meet these expectations, the study draws on Bourdieu’s sociology, which starts from a circular and dynamic relationship between individual practice and social structures. Following Bourdieu, society is considered a social space with agents who occupy a specific position and with power relations between those positions, which limit their space of possibles. Thus, every social practice (and this includes the practice of filmmaking, too) must be seen as an interaction of an agent’s personal history and the configuration of the social space or, more precisely, as the result of habitus, capital, and the surrounding field structure. Whereas the term habitus describes an agent’s socialized subjectivity (the outcome of his internalizing certain social structures that guides his worldview and practice), the concept of capital sums up all his (economic, cultural, social, and symbolic) power resources. However, it is the structure and logic of the field (a social microcosm with hierarchies and constraints) that finally defines which habitus and capital are promising. That being said, from a Bourdieusian perspective, it can be assumed that the field of movie directors forms part of the broader field of cultural production, which belongs to the field of power, but is not completely independent from other higher ranked subfields. More precisely, whereas the autonomous pole is about to work corresponding to the genuine logic of the field, the heteronomous pole reflects external effects (resulting, for example, from the political or the economic field). In this spirit, the analysis focused on typical habitus patterns in the field of filmmaking, the promising mixture of capital, and the configuration of the field (particularly, regarding hierarchies and autonomy). The research material consists of 42 expert interviews with German movie directors from both large-scale and small-scale productions as well as two dozen documents, which were examined with the aid of a category system. The findings show that filmmaking in Germany is anything but unconditioned. More precisely, despite professionalization and audience orientation, the field of German movie directors is characterized by an outstanding heteronomy, which goes far beyond economic parameters. According to the theoretical perspective, this result, first, refers to the origin, socialization, and experience of the directors, who, almost without exception, belong to the upper middle-class, chose this professional direction only in their 20s, and then tried to study the craft of filmmaking properly at film schools. However, there, they did not only gather the necessary capital to enter the field, but also became familiar with the field-corresponding practice, which finally made them adopt a conformist behavior. Second, the examination of the movie directors’ promising capital resources reveals that participating in the reality construction of German film does not only imply mastering all (artistic, technical, and organizational) facets of filmmaking as well as the readiness to bridge stages of economic uncertainty. Moreover, solid networks are as crucial as making a name for themselves (a film that has box office success or is awarded)—significantly less inside but rather outside the field, thus among producers, TV editors and film funders, who are essential for getting the next movie financed (and keeping a steady position in the field). Consequently, the configuration of the field of German movie directors reflects strong interactions with field-external agents, which does not only include the struggle with commercially-oriented producers and distributors, but primarily the confrontation with public TV broadcasting’s requirements of appropriate settings and genres as well as film boards’ demands of profitable casts, locations, and stories. Given these parameters, it hardly comes surprisingly that although German movie directors consider themselves as audience-oriented artists, their career paths, self-concepts, and goals mainly express the incorporation of the field-specific constraints and rules. Thus, to make a living in the field, they are willing to line-up their work pragmatically according to the well-known external necessities. Put differently, Bourdieu’s understanding of an autonomous pole in every field of cultural production, which exclusively works corresponding to its genuine logic, is a utopic ideal, when it comes to the field of movie directors in Germany. Hence, although the German film funding system offers a place for filmmakers beyond the mainstream and guarantees the realization and public attention of niche productions, this does not mean escaping from society’s power structures and paving the way for a broader spectrum of filmic reality constructions.